The Gatekeepers, a 2012 Oscar nominee for Best Documentary, finally debuts in Columbus this weekend, and it proves to be a fascinating, informative, and often frustrating take on the complex state of world affairs. 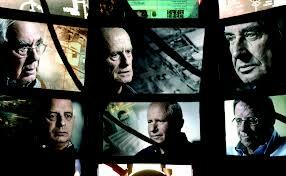 Israeli director Dror Moreh presents the first ever interviews with the six surviving former heads of Shin Bet, Israel’s intelligence agency. Through their frank recollections and candid revelations, we not only get valuable history lessons, but sobering reminders of how these lessons apply to today’s headlines. As you might guess, at the heart of the film is the Israeli-Palestinian conflict, and Moreh traces it as far back as the Six Day War of 1967, when Israeli forces conquered Syria, Jordan and Egypt. Though tensions go back much further, the case is made that it is around this time that Shin Bet began to focus on what were, in their view, terrorist attacks against Israel. The smart bomb strikes depicted in Syriana and the intense manhunts of Zero Dark Thirty come to life through stunning archival footage and the occasional reenactment. This blood is real, and the rationale for spilling it becomes clouded as the former Shin Bet leaders open up about what they’ve learned. Moreh doesn’t pass any judgements on why the men finally agreed to talk, but it isn’t hard to draw your own conclusions. Telling phrases such as “One man’s terrorist is another man’s freedom fighter” give you a glimpse into the souls of men who have come to doubt the very philosophies they once risked their lives for. Though it does get a bit dry toward the end, much of the film is nothing short of riveting. The men, after all they’ve seen, do seem to favor the “separate state” solution, but there are no easy answers provided and no happy endings expected. Instead, we are left with an air of tragic futility as The Gatekeepers, even coming as it does from a distinctly one-sided perspective, courageously questions allegiances, motives, and history itself.